For me, September always marks a new beginning. Maybe I’m still grounded in the “first day of school” mentality. Or maybe it’s the changing colors of the leaves. 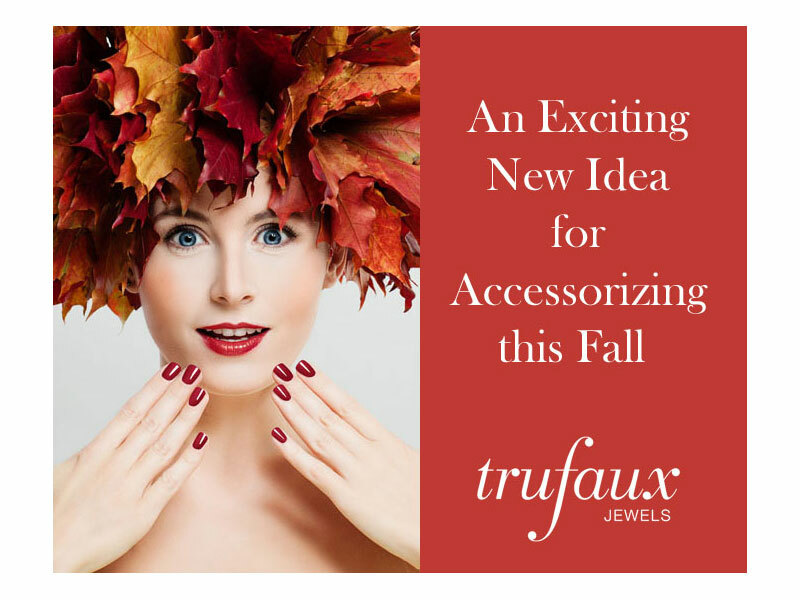 Either way, I’m always looking for new ideas for jeweled accessories. And I’m sure you are, too. So here’s an exciting new idea for accessorizing this fall: the double clip brooch. 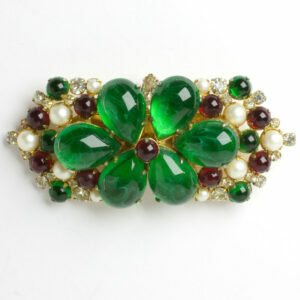 What Is A Duette Brooch (or Double Clip Brooch)? First created by the fine-jewelry maker Cartier in 1927, a double clip brooch was a pin-backed mount for two dress clips, so they could be worn together as one brooch or as two separate jewels. 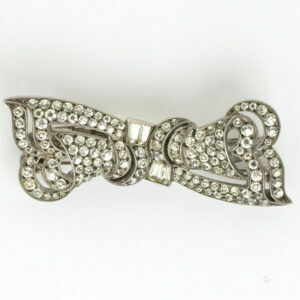 Dress clips were already enormously popular in the 1920s because of their versatility. Dress clips were fastened to dresses to accentuate a neckline – e.g., a single clip at the bottom of a v-neck, or a pair worn at the right angles of a square neck or on either side of a round one. Clips also decorated jackets, hats, handbags, and shoes. Clips could even be worn in the hair, anchored with bobby-pins. So this already-indispensable accessory was made even more essential when it became a two-in-one jewel. The first costume jewelry maker to offer a double clip brooch to the market was the prominent American company Coro, who announced “An Exciting New Idea!” in this 1935 ad in Vogue. 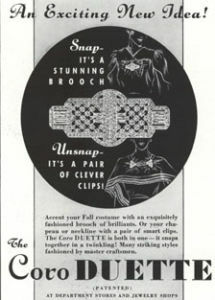 Coro’s product was called a Duette, a name that is often used to describe this type of jewelry in the same way we tend to call all brands of facial tissues Kleenex. Based on Coro’s success, other companies invented their own models. Trifari’s was called Clip-Mates. Prominent makers, such as Mazer Brothers, Marcel Boucher, and Pennino, as well as other companies in North America and Europe also created their own versions. Each of these mechanisms was patented. If you’re interested in the technical side of this topic, you can see the major patents here. The first versions were mirror images of each other. These two examples with diamanté are from the mid- to late-1930s. The piece on the left, which was made by Coro in Canada, is the epitome of the Art Deco style. On the right is a furled-ribbon design in sterling silver, made by the British company Ciro. To see more details about each piece, click on its picture. By the 1940s, some makers were producing more three-dimensional pieces. 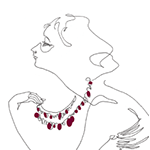 The finest example from that decade in the TruFaux Jewels boutique is this piece by Coro. 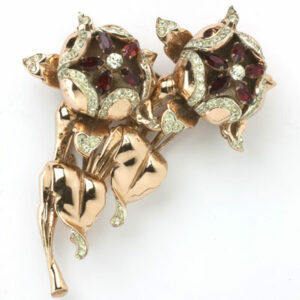 Made of rose-gold-plated sterling silver with ruby-glass stones and diamanté accents, this double clip brooch comes with matching earrings. Click on this photo for more information on this gorgeous piece. Here are two beautiful and colorful examples from the 1950s, both by Hattie Carnegie. For more information on each piece, click on its photo. 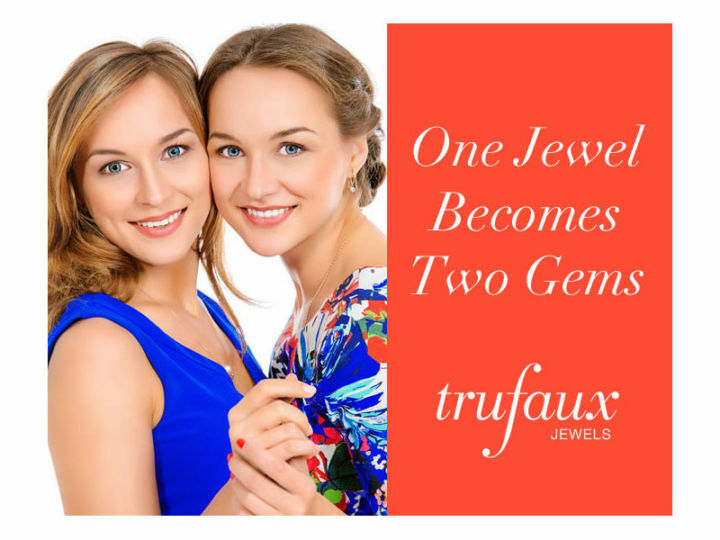 While the two-in-one aspect of the jewel was emphasized when these pieces were created, I propose a third use – as a pendant on a cord or chain. I think that some designs, such as the Carnegie pieces above, work better for this type of wearing than the two 1930s all-diamanté pieces shown. But that’s a matter of personal taste. If you like this idea, you can also wear a single clip in this way. 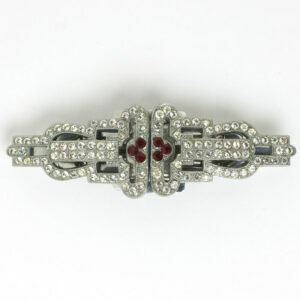 Here’s a diamanté and faux ruby German Art Deco piece from the 1930s that’s another good example. 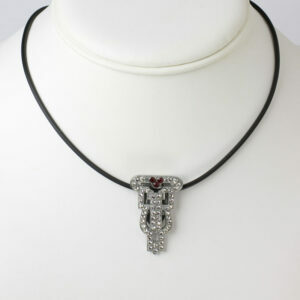 I love this design on the black rubber cord shown, or on a silver or white-gold chain. 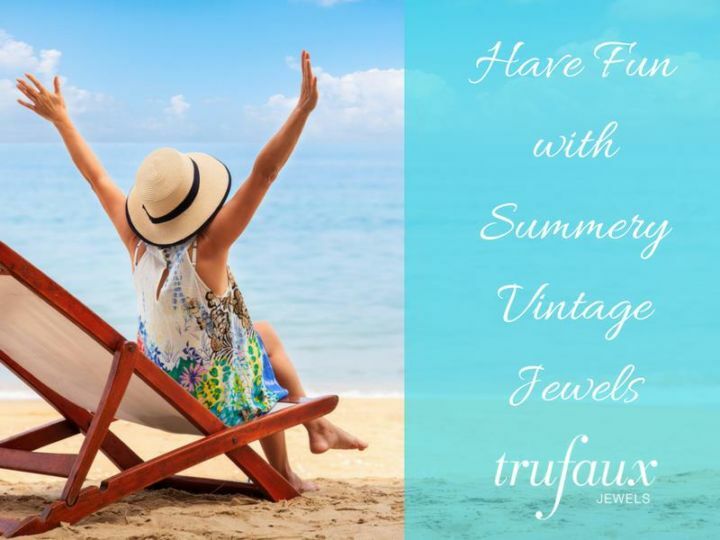 You can see more double-clip brooches as well as single- and pairs of dress clips on the TruFaux Jewels website. Stay tuned for my next blog post, which will show you several ways to wear double-clip brooches with contemporary day and evening wear. I love, love, love that you included the patent drawings! Techies like me gobble this stuff up. Your blog is always full of surprises, Barbara. I’m glad to hear that you were pleasantly surprised. I don’t consider myself a techie, but I am fascinated with jewelry patents. Thanks for writing.